One of the unexplained elements of British culture is their love of strangely flavoured crisps ("chips," for those of you playing along at home). Yes, I did actually try these. 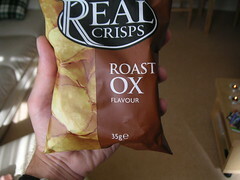 But having never had roast ox, I'm not sure how close they came to the real thing. I suppose "strange" is a relative term...I tried "olive and thyme" flavored Lay's potato chips in Turkey. I actually think it's really cool when large multi-national companies adjust their menus to local taste buds, such as McDonalds. They may, indeed, be involved in a plot to make us into one big, nasty McWorld, but I sure did enjoy the teriyaki burgers and corn pies in Asia! I could never get used to the shrimp crisps. Roasted ox is a new one, though. Who remembers hedgehog flavoured crisps. Mid eighties they came out. As a exiled welshman I do miss golden Wonder brand of crisps especially prawn Cocktail and remeber the time you used to get regular crisps with a blue bag of salt inside! Ahhhh nostalgia! Hedgehog flavoured crisps hailed from Newport. I believe the manufacturers were taking to court for false advertising, but ingeniously provided some gypsies/-insert favoured PC term here- as expert witnesses who confirmed that the crisps did indeed taste like the hedgehogs they would sometimes eat, and it was agreed that if the name was changed to "Hedgehog flavour" trade could continue. And the thing is, they all pretty much taste the same. I'm just glad they're REAL crisps, those plastic ones just don't hit the spot. When I lived in the North East of England I subsisted on Walker's pickled onion crisps and Vimto. Feel free to throw in a sausage roll and a Mars bar in that equation.